Marc Belfort Interview with Bruce Duffie . . . . . There are many ways to pursue an operatic career, and it can be assumed that most of the readers of The Opera Journal are involved in some aspects of that adventure. Those with fine voices seek good teachers and great coaches in order to prepare and develop into artists. The goal is usually a career of singing certain roles in opera houses of stature someplace in the world. But it is nearly impossible to make the jump from a studio to the stage without a step in between, and that is what Marc Belfort provides. The International Opera Center in Zurich, Switzerland, has been taking the developing talent and finishing the basic learning process for over a quarter of a century, turning out many fine musicians who enjoy interesting careers. For half of its existence, Marc Belfort has been the Director of the Center, and has forged it into one of the most impressive and successful ventures of its kind. Each year, hundreds make application and audition for the few spots in the ensemble, and those who are accepted get a special training and depth of background that serve the budding artists throughout their careers. Marc Belfort returns to America each season to search for new talent to take back with him to Zurich. A couple years ago, I met with him while he was in Chicago hearing some of the voices produced by the Windy City. He was pleased to be able to chat about various aspects of his work, and here is much of what was said that afternoon…..
Bruce Duffie: Let’s begin with the obvious question – what exactly do you look for when someone sings for you? Marc Belfort: I look for a young singer with an exceptional personality, an exceptional voice, an exceptionally good technique. I look for a potentially useful member of an ensemble and naturally I look for someone who eventually, given several years’ experience in an ensemble, may have the qualities that will allow him to emerge as a star. I don’t look for stars. I look for a person who will populate the everyday task of mounting productions every single night in an opera house all year round with five weeks vacation in the summer. BD: Do some stars emerge from this kind of ensemble? MB: Absolutely. For the greatest amount of time in history, most of the European stars emerged from this sort of a structure. At the present time, there seems to be a shift toward the stagione system, a seasonal type of production calendar in which one or two productions are played and singers are hired for the production rather than for the year-round ensemble. From my point of view, that’s a pity. BD: In the searching process for young talent, you say you’re looking for all these qualities. Can it be determined if any person possesses the necessary ingredients in an audition which lasts only a few minutes? MB: I like to think that one of my talents is the ability to recognize it. It’s very difficult for someone who can’t do it, and for someone who can, it’s the easiest thing in the world. Charisma of concentration – that’s what I look for in a singer; people who participate in their own performance while they’re doing it, and that’s a very rare thing among young singers. It can’t be manufactured, but it can be nurtured. BD: Do you find that the voices these days are any different from those of ten or fifteen years ago? In other words, is your job getting easier? MB: No, I would say that I’m hearing more and more singers than I’ve ever heard. Last week in New York I heard over 200. I listened to auditions from Monday to the end of Saturday, going every day without lunch, without a break, and found that in spite of the larger numbers of singers that I’m hearing recently, the number of really interesting singers has not increased – if anything it has decreased. I don’t know how to explain that except, perhaps, young singers themselves are less self-critical and therefore present themselves to me even though they’re not prepared. BD: Should they not come to you at all, or just not so soon? MB: I would always be interested in hearing any singer that wants to sing for me no matter what state of mastery they’ve achieved. Many singers come to me not to be seriously considered for my program in Zurich, but to ask advice. One of my trademarks is the feedback I give after an audition. I always try to tell a singer something constructive and something that they may not hear from their own teacher or from the people with whom they work on a daily basis. I try to give them something to make the audition with me a learning experience. I’ve been gratified to receive letters months later from people that I’d talked to and discussed problems, telling me how much it meant to them, and that they’d taken the criticism to heart, discussed it with their teachers, and felt that they’d gotten to a new plateau because of it. Some of the discussions I’ve had with singer have been very difficult. I’ve had to deal with some of their personal problems. One had a tremendous weight problem, so much so that she could not even consider a professional career despite having a very beautiful voice. A year later, she returned looking quite slim and very beautiful, and with an even better voice and repertoire. She was able to sing lighter roles which, when she was so heavy, did not seem to suit her at all, but were better for her voice. This sort of thing is part of my work. When I have a singer make an audition a truly artistic experience, I fall over; I fall in love and I invite that person to Zurich. That happened again recently. She proved to me that she had the vocal capacity and technique, that she had something to say, and there was a charisma that I look for in singers. BD: What more can you offer her when she arrives at your center in Zurich? MB: Part of what we do is to put the finishing touches on a singer like that. We help in guiding the selection of repertoire that is best for her. She sang several arias, each going in a different direction. She’ll have to decide which is best and we can help her with that process. Even though she has learned and performed several roles at the university level, some might be too ambitious at the start of her professional career. Someone who has the talent must be guided so that she fully exposes her talents but does not go beyond her capabilities. That way she can realistically be presented as someone who has a future and not a past. It’s the old saw – you sing on interest and not on capital. This is one of the biggest problems – to give the singer a future and not deal with them when they’re already on the downside. BD: How do you get them to rein in their ambitions? MB: Part of that is their own intelligence and self-interest. Very often, I appeal to them on a purely practical basis. I also must convince them to trust me. Young singers get advice from many sources and they must find the ones they should believe. Part of the talent of becoming successful is believing the right people. I have a good track record, having been in Zurich 14 years. Almost 90% of the singers I’ve brought into the studio have gone on to professional engagements. On an international basis, that’s awfully good. I can do it because the selection is part of the instruction. I take people I know can succeed and want to succeed, and who need what I can give. If I sense that somebody is very good but doesn’t need what is given at the center, then I pass because it’s not the right situation for that person. BD: Do you get advice or recommendations from other teachers or coaches or managers? MB: I would never take someone on a recommendation alone – I’d have to hear them myself. I can’t be responsible for them otherwise. There are so many sleepless nights over decisions – should I or shouldn’t I give this one or that one the benefit of the doubt? I am willing to hear singers again the following year, but that second audition often reinforces my original decision. I can’t explain my hunches or feelings; I’m not a machine. I help each singer find within themselves the joy involved in truly expressing their emotions. You’ve got to play the game, and one of the rules is that you stand on the stage in front of everybody and totally reveal your inner life in such a way that you’re not revealing your private personal life. But you do reveal that which is in you that everybody else can relate to. You share the basic humanity that is within you with the audience. Being able to do that can be learned if you have the basic capacity. It’s very exciting to see young people unfolding like a flower, and by the end of their work in Zurich, they’ll audition and get a marvelous contract. BD: Do you ever feel that someone should not be singing at all professionally? MB: That happens in auditions. I try not to be too brutal, but since beauty is in the eye and ear of the beholder, I tell them that they just don’t fill the requirements for becoming a professional singer. I ask what else they have studied or have an interest in, and suggest that a career other than singing might result in their having worthwhile and positive lives, whereas pursuing the performing might waste the most beautiful part of their lives in frustration. BD: Even for the singers who do go on and make the career, is the opera business perhaps too brutal? BD: Are the young singers today building careers so that they will be the revered older generation tomorrow? MB: Some of them are, but some are falling victim to the “fast career” syndrome. It’s not always their fault. They are pushed by their agents and managements, and lured by the possibility of making it while they can. We have jet planes that allow someone to sing in Chicago today, Zurich tomorrow, then in Berlin and Vienna, and in San Francisco two days later. A lot of singers struggle up to a certain point and finally hit it. Even if they’ve been in an engagement for several years and have sung on a regular basis and lived a fairly normal life and built up a reputation, the moment they get into that “international circuit,” they lose their self-criticism and their caution, and start squandering their vocal energies. After a trans-Atlantic flight, I can hardly talk or do anything, but some of these singers go right from the airport not to the hotel but to the opera house for a rehearsal or even a performance. Then they’re packed and out of the hotel the next day, off to another engagement. Doing this week after week will cost them the keen edge on their bodies, and the voice will start to show signs of wear and tear. BD: So a singer must treat himself like an athlete and be in condition all the time. MB: Exactly. This is one of the saving graces of most singers – they’re not quite as bohemian as, for instance, actors. Generally speaking, singers stay away from most harmful things. One of the most damaging things is the after-performance party where there’s lots of smoke and everyone is trying to talk over a lot of noise. Most of the successful singers just don’t go to those gatherings. They sacrifice themselves and are called “Prima Donna,” or they insult the local groups who have set up buffets and want to introduce them to their friends, but those couple of hours after a performance can be more exhausting than the performance itself. BD: Let me throw a joker into this discussion – what part does the availability of recordings play in the expectations of the audience and the preparation of the singer? MB: That is a big factor. I grew up on recordings that were done in one take. The way people sang in the recordings was the way people sang. The moment that recordings started being easily manipulated out of more than one take – when splicing made possible a technically perfect performance and when sonic alteration become commonplace – records were no longer true. BD: Is it a fraud? MB: It’s not a legal fraud, but certainly an artistic fraud. With so much at stake, it’s understandable that the artist and the company don’t want to put out something that is not pretty nearly perfect. It’s a document upon which they are judged more than on their live performance, and causes disappointment when the public does hear them in person. I think one of the exciting parts of the performance is the tension before an aria, the uncertainty of whether or not it will come off. However, if it’s not perfect, it still can be gloriously convincing in the totality of the theater experience. Singing on the stage is not just audio; it’s a multi-media type of thing. The audience should not close its eyes and just listen to the voice and try to reproduce a living-room experience from their stereo. The public should plunge itself into the spontaneous and immediate total-theater experience. BD: How do you get the young singers to get away from only wanting to do the so-called standard roles? MB: This is one of the basic conceptual factors in our program. Singers are interested in learning the standard repertoire, but most are not technically ready for those parts yet. Learning stage-technique at the same time you’re trying to conquer technical problems of an important role is not a good idea. It’s more important to master the problems of being onstage in performance with a part that you may never do again in your life. It’s like a throw-away. BD: So you throw away the part but not the learning. MB: That’s right. There are two kinds of singers. First are those that are not very musical or are not particularly well-trained but have pretty voices. They sometimes have to have parts – music and stage directions – hammered into them. They start at ground zero with each new part, carrying nothing from the experience of the previous work done on another part. Some of these people make good money, especially if they’re tenors with very good high notes, but they have very little to say artistically. The other type of singer is the good musician who has studied languages and is interested in life in general, is a kind of philosopher and is interested in the relationships between people. This one will notice that a scene in The Marriage of Figaro is similar to one on Dynasty. They are interested in being convincing singing-actors; not just singing opera but making music-theater. That’s the kind of young person I like to work with, and they ultimately become the artists with something to say, especially when they also have that sensual quality and temperament of a deep-feeling human being. These people combine the intellectual aspects of the art form with this almost child-like, spontaneous personality. That’s not easy to find. Usually they’re either all heart or all mind. The great performers are combinations of the two. And of the greats, one might have a more interesting psychological coloration to a character, and the other may achieve more through sheer beauty of sound. But there can’t be an absence of one in favor of the other. There has to be a balance of some kind. BD: Do you also nurture young conductors? MB: We have two rehearsal accompanists/coaches each year and sometimes they go on to become conductors. I remember on one of these trips to Northwestern University a few years ago, I met a pianist whose technique was so good that he played everything too fast. I advised him to slow down in order to experience the notes as he was playing. He said he wanted to be a conductor so I advised him to learn German. A few months later he called me to say he had enrolled in Munich and had learned German, and had even memorized Der Rosenkavalier. I heard him play soon after that, and engaged him for the Center. Now he’s assistant to the Music Director at Aachen – that’s where Karajan got started. BD: Let me take this one step further – do you ever nurture the composer? MB: This is something that I’ve long wanted to do. We have had some contact with modern composers, and have produced works that have been written during a residency at our Center. These were special situations, funded by a special fund which was for a work to be done in the June Festival at Zurich. I have been trying for the past several years to establish a composer-in-residence workshop within the Opera Center in which young composers who want to be involved with an opera company, or be close to opera singers, can set up a situation in which they would learn and teach at the same time. It’s very difficult to find a composer who is flexible enough to get into this kind of situation. In this case, “young” doesn’t necessarily mean youthful age, but it requires a youthful spirit. It could be a very nice aspect of our work, but not a major one because there is so much to be learned in the traditional repertoire and the classical works of the Italian, German and French composers. However, we need to find a suitable composer and sufficient time within our very busy program to make it work. I’ve not given up on this. It would be nice to have it be a Swiss composer, but to get the project funded I may go to a multi-national corporation and open it to a composer from any country. It’s great for the singers, because to sing a part that has never been sung before is a wonderful experience, and to have personal contact with the composer and perhaps even give input on the way the part will be written would be fantastic. It would also be great for the composers. Many are interested in writing operas but don’t know much about the voice, and this would give them the opportunity to learn the vocal instruments. Some modern composers write all the high notes for the basses and low notes for the tenors. Part of that is playfulness and part is because they just don’t know the voices. MB: Let me turn it around. Opera is not going to be an elite type of art form that it was for many years. Going to the opera to be seen was part of the whole tradition. In order to survive, opera must become an art form which appeals to the broad scope of the public. In a way, it has to appeal the way baseball or football does. It’s possible by means of TV or video cassette. It’s possible to present opera in large stadium situations where a huge audience can all see a production at the same time – like in Verona, or, as in other cities, in sports arenas. We did it that way in Zurich when we were renovating the opera house, and now it’s become a tradition to do something there each year. You can’t do The Marriage of Figaro like that, but there are many spectacle-type works that do just fine. The traditional opera-goers didn’t go, but all those who did come enjoyed it and experienced opera for the first time in their lives. And when word got around, the regular lovers came and found it to be a wonderful experience. But to reach the numbers we did in just a few performances in the arena, we would have had to play the opera to sold-out houses for several months, and no company can do that. Many of those new people now come to performances in the opera house, so we have to take opera out of the exclusiveness of the small theater. This will also help economically, and will forestall some of the cutbacks the various cities have instituted. Bruce Duffie can be heard regularly on WNIB, Classical 97 in Chicago. Next time in these pages, a conversation with Ardis Krainik, General Director of Lyric Opera of Chicago as she guides the company toward its gala 35th season. Marc Belfort, who was the director of the International Opera Center at the Zurich Opera for the past 24 years, died in Zurich on March 4th, 1998, after a long struggle with cancer. A native of New York, Marc studied singing and philosophy at Columbia University, and sang professionally as a cantor in New York City. He appeared as an operatic baritone in Europe, South America and the U.S, in addition to being entertainment chief for the U.S. Army in Europe and an artist manager/impresario in Germany. Recognized by the European operatic community as a master teacher and connoisseur of operatic talent, he was a 1991 recipient of Switzerland's coveted Doron Prize for his contribution to culture. Besides his services as coach, teacher, administrator and over-all mentor promoting his student artists to agents and theater directors, Marc was an accomplished stage director who presented many critically acclaimed studio productions in Zurich. Besides being responsible for the day-to-day operation of the studio, organizing concerts and seeking financial support for the students, Marc was active in the main house. During the theater's remodeling season, he was director of production for Aida and West Side Story in performances at alternative venues. Zurich Opera's current General Director, Alexander Pereira, describes Marc's work on the last Zurich Festival's production of Elisir d'amore as "characteristically spontaneous, charming, loving, humanistic and professional." The opera company's artistic personnel, who regularly chose Marc as their representative, valued his abilities as a caring mediator and a patient, tenacious negotiator. He was the embodiment of truth and ethics, and his unerring sense of artistry and style earned him the highest respect of the community inside, as well as outside the opera house. He inspired devotion and trust and his opinion about various operatic topics, such as which roles are appropriate for which singers and how to interpret a new role, were sought and valued not only by his current or former students, but by established artists from all over the world. His tireless enthusiasm and cheerful energy helped many young talents realize their full potential. 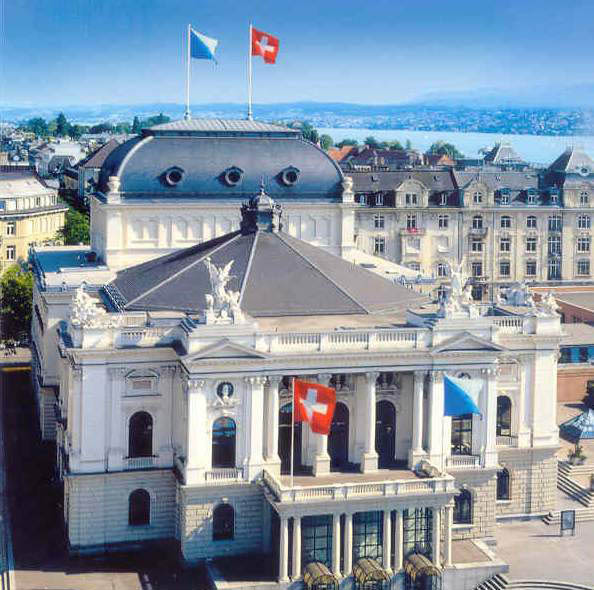 The Zurich Opera Studio was founded by Herbert Graf in 1961. After becoming director in 1974, Marc expanded this training center for young opera singers into a world renowned institution known popularly as a Talentschmiede (forge of talent) with himself dubbed Sängervater (father/mentor of singers) by the media. Many international careers were launched under his guidance. His love of music and theater coupled with his passion for nurturing young talent gave him the strength to transmit this energy to his students. With his wife, the popular leading soprano of the Zurich Opera, Renate Lehnhart, he often held workshops and participated in festivals around the world. He not only developed singers, but many coaches/conductors and stage directors were molded by his operatic vision. This interview was recorded in Chicago on May 19, 1987. The transcription was made in 1989 and published in The Opera Journal in June of 1989. It was slightly re-edited and posted on this website in 2009.